After breakfast in Portrush, it was time to say goodbye to my host and travel companion Muna. I headed out of Portrush on the coastal road taking in the views of the Atlantic one last time and eventually turned south onto the B62 towards Ballmoney. There, I turned onto the A26 towards Ballymena, Antrim, and eventually Belfast International Airport where I arrived around 10am. My flight home would not leave till the early afternoon, but I had wanted to get to the airport with ample time for returning the rental car. On our long journey south on June 8th, the windscreen chipped when another car overtook us at high speed, depositing some gravel from recent road works on it. This was dealt with promptly by Hertz, so I ended up at the check-in counter much earlier than expected. Fortunately, the British Midlands ticket agent suggested I take an earlier flight to Heathrow to which I happily agreed. From Heathrow, I took a Lufthansa flight to Frankfurt. 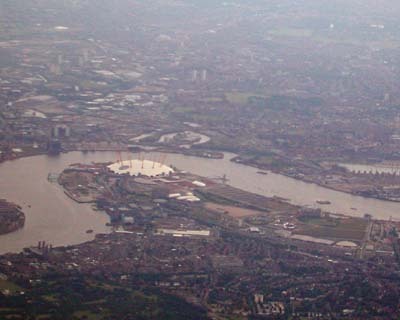 While the plane climbed out of Heathrow, I caught a few glimpses of the Thames and the now deserted Millenium Dome. At Frankfurt Airport, I easily caught my ICE train back to Bonn. I arrived back home safely shortly after 11pm.